Today we continue learning about "Becoming A Christian Soldier" and learning how to "put on the full armor of God" (Ephesians 6:11) - Now, I have to be very clear - I am NOT talking about becoming a physical soldier and I am NOT saying that you should go out and physically fight (although I appreciate and respect anybody who has served or is serving in our army, navy or air force). What I'm talking about in this series is on a spiritual level. If you look at Ephesians, chapter 6 verse 12: "For our struggle is not against flesh and blood..." that is the exact point - we are not talking about a physical fight and we are not talking about physical training. Becoming a Christian soldier is all about our relationship with God; about our spiritual training and about our spiritual self. A few months ago we learned about who our enemy is and then most recently we learned about the HELMET OF SALVATION. Click HERE to read INTRODUCTION to this series. Click HERE to read "STRENGTH FROM GOD"
Click HERE to read "4 Ways To STAND"
Click HERE to read "BELT OF TRUTH"
Click HERE to read "BREASTPLATE OF RIGHTEOUSNESS"
Click HERE to read "FEET FITTED WITH THE GOSPEL OF PEACE"
Click HERE to read "SHIELD OF FAITH"
Click HERE to read "HELMET OF SALVATION"
Our God is all powerful, all knowing, He is our Protector and Provider - He would never throw us into a battle without fully equipping us first. Today we continue learning about the "full armor of God" and specifically "the Sword of the Spirit." It is interesting to me that there is an order to the verses in Ephesians chapter 6 - first we must prepare, train and draw from God's power ( "after you have done everything" - verse 13 ) and then we must STAND. It's not all about the preparation, eventually we must "do" or "act" - we must implement what we learned in our training. Up to now, all of the Spiritual weapons that we have been learning about had to do with protecting ourselves against the evil coming towards us; the belt of truth, the breastplate of righteousness, feet fitted with readiness, the shield of faith and the helmet of salvation. Those weapons were defensive weapons but today we start talking about offensive Spiritual Weapons. 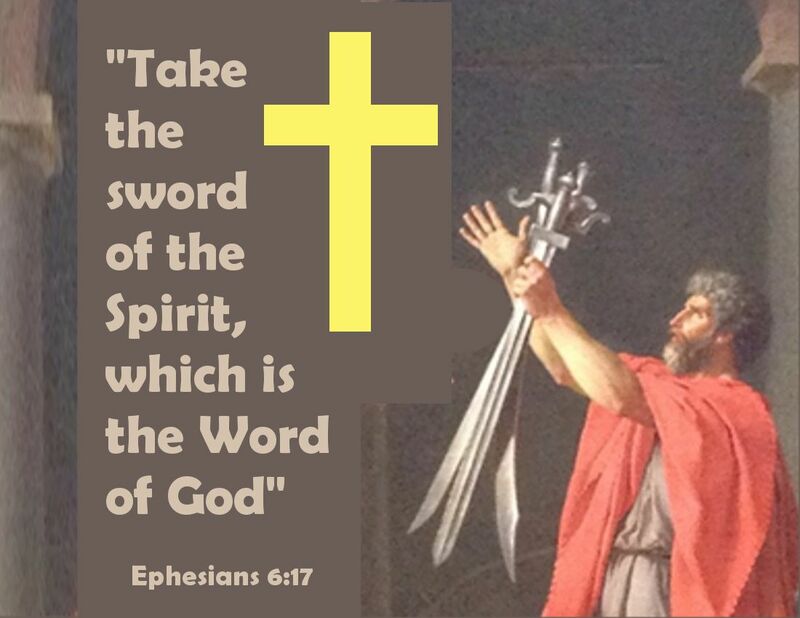 This weapon is "the sword of the Spirit, which is the word of God." "For the word of God is living and active. Sharper than any double-edged sword, it penetrates even to dividing soul and spirit, joints and marrow; it judges the thoughts and attitudes of the heart." First of all - What is a double-edged sword? - It is a sword that has 2 sharp sides, which means that no matter what way you swing this sword it WILL penetrate! There have been many times when I have either read the Bible or heard a verse (or verses) that touched me so deeply that it almost seemed like they were meant for me alone. That message from God is felt so intensely that it cannot be ignored. It might be a conviction about something that I need to correct and change or it might be encouragement giving me the confidence to stay on the right track. These urgings are from the Holy Spirit and they literally come from the deepest parts of my being; my heart, my gut and even my bone marrow - just like the old saying "I can feel it in my bones." God works through us to help others. As an example - You might quote a Bible verse to a friend & not really understand why you brought that up but later find out that the friend who heard you was touched or maybe even later became a Christian. (Caution: We all need to be careful here not to become arrogant! These words that you are quoting are not your words they are God's words working through you. Make sure you give the glory to God and NOT to yourself). The order in which this Spiritual Armor is listed is also so important. If we follow the chronology of the verses in Ephesians then we must first condition and prepare ourselves before we can go out into this evil world. Make sure that you continually meditate on the Bible (God's Word), so that every word that comes out of your mouth will be God working through you.